I was in a bad mood and went out for a little retail therapy. My first stop was Target, but all I got there were 2 packs of 2005 Topps Updates & Highlights for $1.59 a pack. I got a couple of first year cards, and a Gold Dan Johnson Prospect card /2005. I bought them because I am on a Russell Martin kick and that was his rookie year. I decided to wander down to Sports Authority despite them being grossly overpriced, and found nothing. Next was the jackpot stop, Modells. There was only one box of cards in the whole store, and it was on the counter. I have "x-ray" vision, and knew which pack had the game used card in it, and only bought that one pack. With my Yankees season ticket holder discount card, the pack cost me $1.86, and it was the best spent buck eighty six ever. 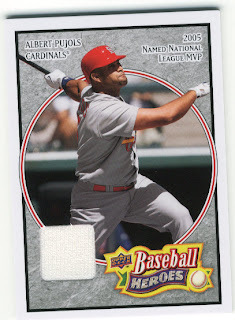 I have never pulled an Albert Pujols game used jersey card before, and today was my first one. That instantly put me in a better mood. It took me until this year to pull both a Pujols and a Jeter game used card. Hooray! Next order of business will be the case of 2008 Upper Deck Masterpieces that are due to arrive at my door on the 10th. Hopefully we end up with some great stuff, we will post the break next week depending on Sooz's schedule with work. I went through a bunch of cards this week and put up some Dodgers and Rays cards if anyone is looking for those guys. Plenty of play-off players available in our store, and if you don't see what you need, please ask.